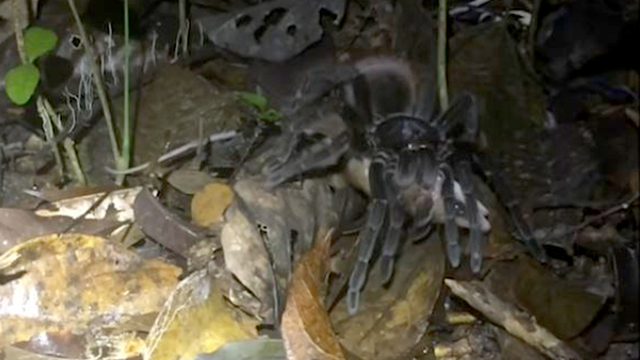 (WTVO) - Instead of fleeing in terror like any rational human being, researchers in the Peruvian rainforest recorded nightmarish video of a "dinner plate-sized" tarantula dragging a baby mouse opossum into the jungle. Science News published the video Thursday on YouTube, saying "When researchers working in the Peruvian Amazon rainforest heard scrabbling in the leaf litter, they shined their flashlights on the ground and witnessed something never documented before: a dinner plate–sized tarantula (Pamphobeteus sp.) dragging a young mouse opossum (Marmosops noctivagus) it had just killed." Thanks for the sleepless nights, science!